All of your October Quests and Legends boxes are packed and nearly ready to go out of the door on Monday. We are so happy with everything in this box and we can’t wait to hear what you think of the featured read too! Your boxes will begin their journeys to you at the beginning of the week and we just love seeing them arrive so don’t forget to tag us! We thought now would be a great time to look back over the month and reveal exactly what our members found inside their September Outlaws themed boxes. We had so much fun putting this box together, especially because it was our anniversary box. It only feels like yesterday that we were getting our first ever box ready to go out to our founding members and we are so thankful that we are still living our dream and spreading the Book Box Club fun all over the world! We work as hard as we can to find lovely bookish items for our boxes, but this month was made especially easy by the very talented craftspeople we had the chance to work with. Thank you for all of your enthusiasm and professionalism guys! We hope that you all enjoyed celebrating our anniversary with us! A JIGSAW OF FIRE AND STARS by YABA BADOE: Sante is orphaned in a shipwreck and joins Mama Rose’s travelling circus, but the ghosts from her past refuse to leave her in peace. Our September book will take you on a dangerous and unforgettable journey, full of exotic trickery, dubious characters, gritty issues & beautiful writing! SCROLLED INVITATION: Put your questions to YABA BADOE at our members-only online book group. 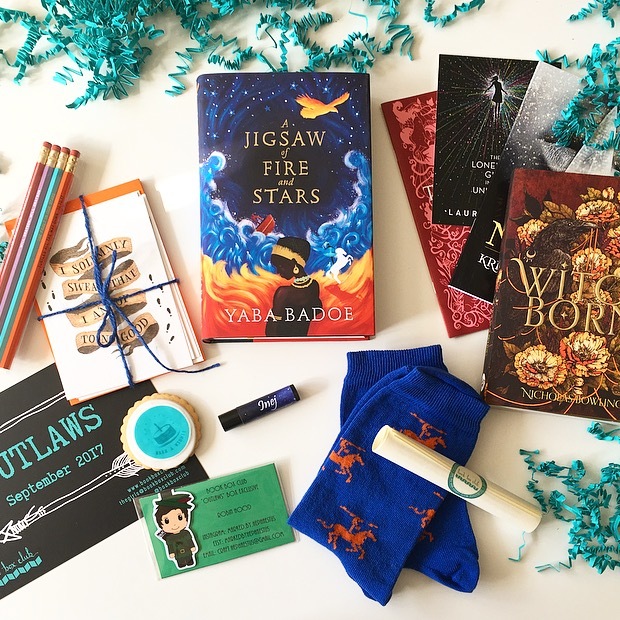 SANTE SOCKS by BOOK BOX CLUB: In honour of the acrobatic heroine of our September read, these cosy socks will spice up your “Sock Sunday” and keep your toes toasty – even OUTLAWS need warm feet! BIRTHDAY BONUS BOOK: In honour of our birthday we’re treated you to an extra read. Thanks to our publisher buddies for these brilliant new releases. Which one did you get? BOOKISH GOODIES: With thanks to our friends at Penguin Random House, Orion, Walker Books, Hot Key Books and Little Island Books. If you’d like to join our club next month and receive our HAUNTED MINDS November box then head on over to our website to subscribe – we’ll be sending our members a beautiful brand new book about feuding families and buried memories. Set against the backdrop of a spooky autumnal orchard and interwoven with echoes from long-dead ancestors, it is the perfect, compelling, read-in-one-sitting-on-a-cold-dark-night book and we think you’re going to get wrapped up in it’s twisty plot and gorgeous writing, just like we did! If you are a fan of other psychological dramas novels like the books of E. Lockhart and Jandy Nelson and you love beautiful descriptions like those penned by Maggie Steifvater then you are sure to ADORE our November read! To get in the mood click here to watch our theme reveal trailer! The book will be a stunning hardback and will be accompanied by a signed book plate from the author and an invitation to our members- only online book group in The Clubhouse, where you’ll get to chat to the brains behind the book (the author herself!) and our other lovely members. Remember, we only have a limited number of November Haunted Minds boxes, so if you haven’t already secured your membership then click here to join us. 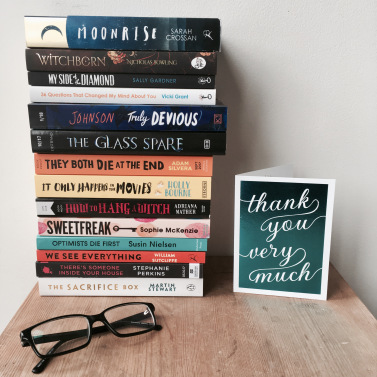 You can now choose between a Book Box Club subscription (book, book group and bookish goodies) or a Purely Books membership (book and book group), so whether you’re mad about bookish merch or just want a guaranteed great YA read, we’d love to welcome you to our club!